Once upon a time, in a life far, far away, my roommate, my best friend, my “domestic partner,” decided she needed to move from our lovely Jersey City duplex apartment to seek new job opportunities elsewhere. The great search for a new roommate began, and I found a girl who was sweet and funny and seemed to get along with the kitties. And then I discovered she had celiac disease, and my heart sank. No roomie pizza Fridays? No Sunday cinnamon rolls? It’s okay, I thought to myself, I’ll learn how to bake for this great new person who would become my new friend. And yet I was dreading that time when the coolest person I had ever lived with would be gone and I would be left with…rice. Thankfully, that coolest person ultimately decided not to move away, and I had to break it to CeliacGirl that it wasn’t going to happen. I felt awful, but at the same time my heart was flooded with relief. Of course, it came back to bite me: I fell in love with a man whose mom has celiac disease, and who, we feared at one point, amidst migraines and tummy aches, might have it too. But I wasn’t going to let the fear override my instinct to bake, to eat the things I wanted to eat and share all these wonderful treats. I would experiment. We would still have pizza Fridays, bread, pasta, muffins, cookies. And pancakes. Damnit, there was no way we were not going to have Sunday pancakes. This, truly, is where the ImaginariYUM was born. There is a whole world of flours out there — buckwheat, brown rice, sweet rice, oat, almond, sorghum. With the right proportions, and, frankly, the right attitude, those flours and so many others can create baked goods that are as good if not better than the real thing. It opens up a whole new dimension. A new opportunity to do things differently, better. 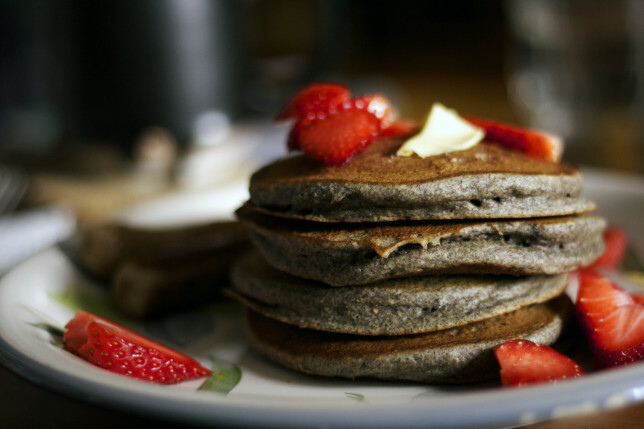 These gluten-free buckwheat pancakes are one of the creations that came out of this adventure, and they’re one of just a few recipes that have stuck around even after we discovered that the fella, in fact, did not have celiac disease. 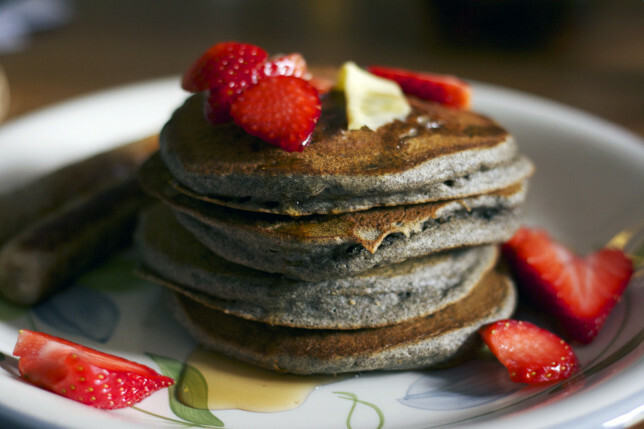 These pancakes are nutty, rich, lightly sweetened. They taste of the earth. 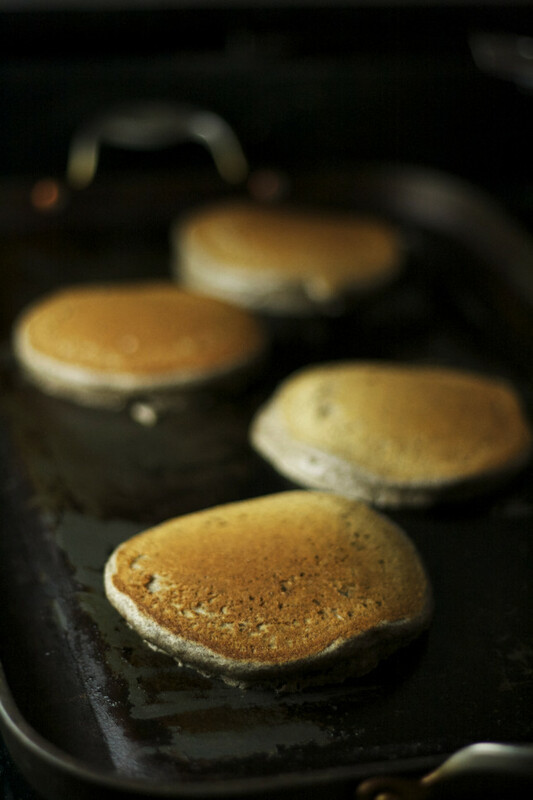 They pair so beautifully with fruit, and soak up maple syrup like the perfect sponge. The formula is simple: 70% whole grain to 30% starch. Measure by weight, not volume, because all flours have different properties, different weights — though here I’ve finally taken a moment to measure it out for you, it won’t be exact without a scale. I’m not going to be the person to tell you to go gluten-free if you don’t absolutely need to. But if you have celiac disease, or are cooking for someone who does, try these. They might set you up for a new adventure. 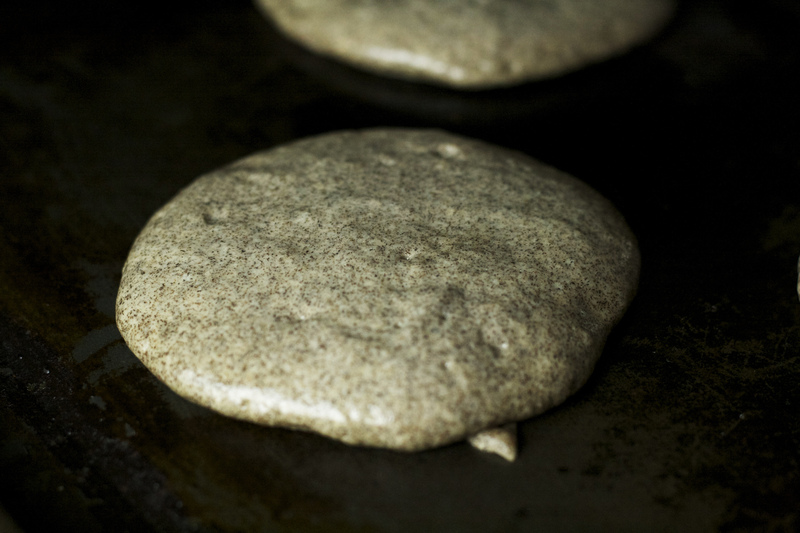 Heat a griddle or large skillet over medium-low heat. In a large bowl, whisk together the buckwheat flour, almond flour, brown rice flour, potato starch, baking powder, baking soda, and salt. Set aside. In a medium bowl, whisk eggs, oil, and sugar until fully combined. Add sour cream and milk and whisk until smooth. 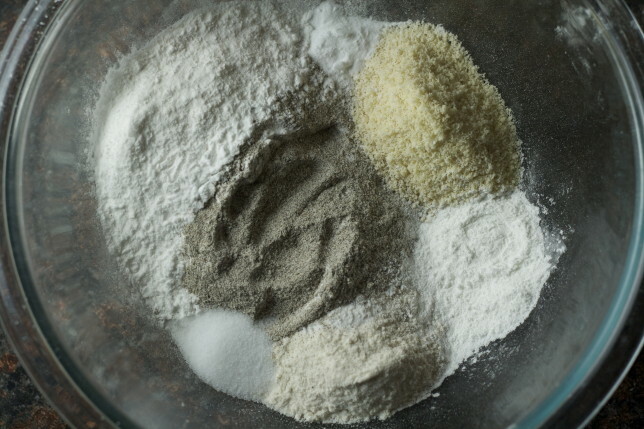 Form a well in flour mixture and pour in the liquid ingredients. Stir until fully combined. The batter will be fairly loose, but will rise and thicken within a moment. Coat your griddle or skillet with butter or a bit of oil and pour batter by the ¼-cupful. Cook until the underside is a deep golden brown. Flip, and cook until the other side is also deep golden brown. Serve right away or keep warm on a cooling rack set over a baking sheet in the oven at 170 degrees.